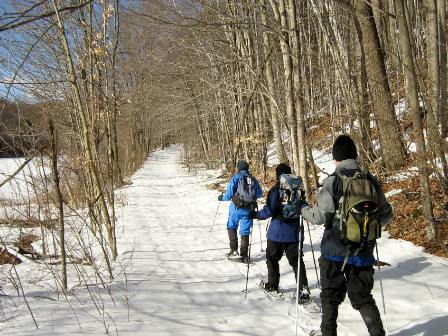 Snowshoe in the heart of the Moosalamoo National Recreation Area within Vermont's Green Mountain National Forest. Near Robert Frost's last Vermont home, we cover the many trails of the remote Moosalamoo National Recreation Area and nearby region. We visit the poet laureate's cabin where recitation of one of his famous poems has been spontaneously known to occur, and the Frost Interpretive Trail. The views alternate between Moosalamoo, Bread Loaf and Romance Mountains, and forest and fields. We also visit beautiful Sugar Hill Reservoir and secluded Silver Lake. Our lodging is at the famous Blueberry Hill Inn, set in the middle of the forest, where good food awaits, a sauna, and a warm fireplace glows at night. Snowshoes and poles are provided, if you need them. This will be a memorable experience that will make you want to return.